September 17, 2011, [New York] - Custo Barcelona presented its new Spring/Summer 2012 collection named "Tripolar", with Innovating 3D Prints, at the New York Fashion Week. 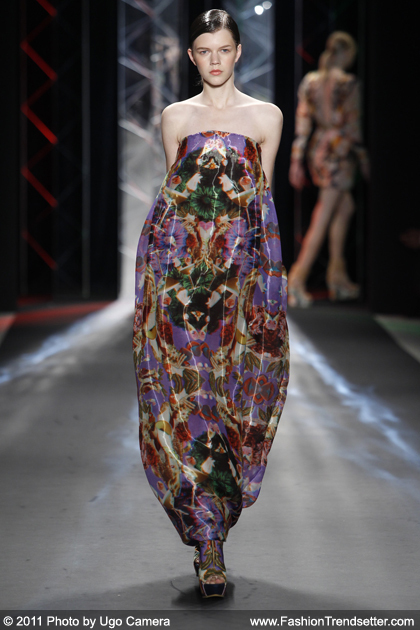 In this SS 2012 garments are divided into three groups, each with its own defined and different theme. This creates a spectacular show on the catwalk, endowing the collection with a triple personality. The second group is presented as KALEIDOSCOPIO. It is a collection based on micro-pieces of different materials, assembled to create a geometrical universe inspired by the kaleidoscope. Key garments are tight-fitting and elastic dresses, swimwear and jackets in different tones of beige, brown, ochre, coral pink, turquoise and acid green. For the line it is been used fabrics handcrafted based on raffia, cotton and silk, and combined with synthetic fibres such as acetate rayon and touches of metal, Lurex, paillettes and mesh net. All images are Courtesy of Custo Barcelona. Photographed By Ugo Camera ugocamera.com Used by permission. The third and last group is named MÍRAME, and comprises evening and occasion wear. It includes pieces of graphics inspired by the feminine fashion universe, created with 3-D technique. The most significant garments are long and short dresses, shorts, tops and swimwear, made of silk and linen combined with nylon, acetate rayon and manual applications to achieve 3-D effects. The colors dominating Mírame include purple, turquoise, pink, orange and grey. The textures in this group are shiny: gold, silver and copper. The accessories line includes clutch bags and sunglasses. There are three types of shoes to combine looks: high heel open ankle boot, platform sandals with ankle straps and open sandals. For men, moccasins that go with any look. A new dimension by Custo, inviting you to be transported, to feel and to enjoy following the trend of this contemporary graphic language that dances to the beat of electronic music. A fascinating proposal full of energy and new approaches that has dazzled in New York of the hand of the designer and which has been attended by more than 900 guests and fans of the brand like Matthew Settle from Gossip Girl, Carrie Preston from TrueBlood, Miss Jay Alexander from America's Next Top Model and the Spanish super model Almudena Fernandez.